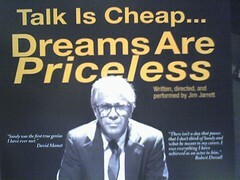 Last night, Krista and I went to see the play "Talk is Cheap... Dreams are Priceless." The play is a one-man show by Jim Jarrett. It was fantastic, both in terms of execution and content. The play showcases the teaching of Sandy (Sanford) Meisner. In fact, the play proceeds as if the audience were in fact a gathering of one of Meisner's classes, and Sandy confronts the audience as he did his students. His teaching style was "unconventional" but absolutely thrilling, focused and of pure intention. 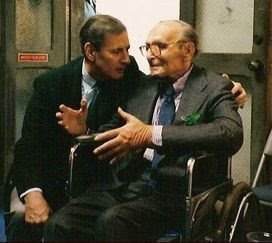 Krista's father William Alderson was one of Meisner's protoges, so the play had special meaning for Krista who knew Meisner as a child.